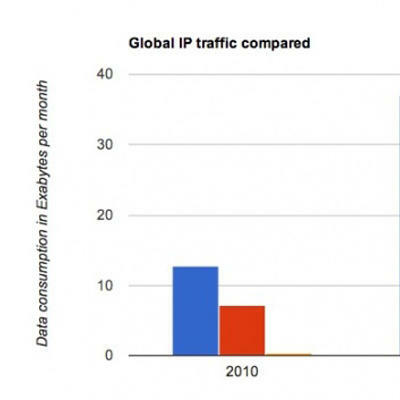 For the bulk of its online life, the world has relied on wired network traffic. But according to a new forecast by Cisco, that is changing. In fact, the report predicts that in the next four years, Wi-Fi will edge out wired connections for the very first time. According to Cisco's new Visual Networking Index (VNI) Global IP Traffic Forecast, wired traffic will account for 37 Exabytes (i.e., 37 billion GB) of data monthly in 2015. Sounds like a whopping amount of data, and it is, but it comes up just short of Wi-Fi's 37.2 Exabyte prediction. This means more of us will be using Wi-Fi than ever before. Wi-Fi accounted for 36 percent of all IP traffic in 2010, but in four years, the number will rise to 46.2 percent. 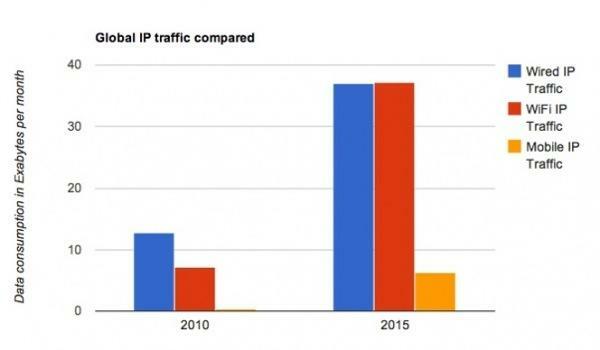 By contrast, wired traffic is decreasing, from 63 percent last year to 46.1 percent. This isn't entirely shocking, considering how many more people have computers, not to mention smartphones and tablets. And for their part, the carriers also encourage Wi-Fi use to ease their slammed networks. According to Cisco, one of the biggest factors to drive traffic will be video. Responsible for 40 percent of consumer web traffic last year, vids will account for 62 percent in 2015. By then, households all over the world will be using an increased amount of bandwidth in general: The total average data consumption will more than triple — from 17.1 GB monthly in 2010 to 61.8 GB — due in part to passive networking, with software programs performing background updates and other tasks. Predictions like this are always interesting, since they offer indications of where things are headed. Based on this outlook, more users will be ditching their wires in increasing numbers, as Wi-Fi and mobile connectivity further entrench themselves into our lives. It's exciting, though not entirely surprising, that more people will be online than ever before. But we can't look at stats like these in a vacuum. It's important to understand how all this will play out in context: By the looks of this, our collective bandwidth demands are going up. And yet the trend toward data caps seems to be just getting started. Yep, the future is looking … pretty expensive.